The book reading for Seeds for a Boundless Life on Friday, October 16, was a wonderful celebration of Zenkei Blanche Hartman’s teaching. Perhaps the biggest celebration that night was simply having Blanche present. She was warmly applauded as she entered the room on her first return to Zen Center in several months. 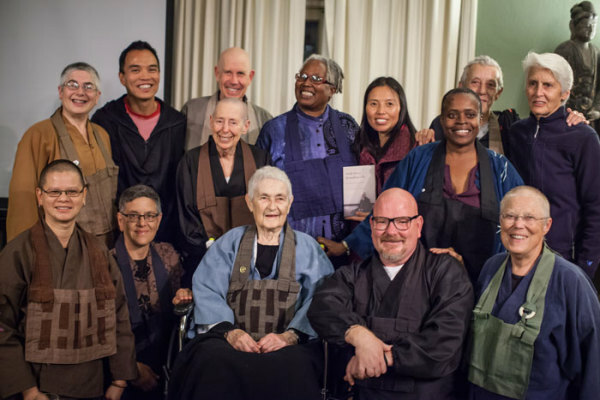 The beloved Blanche is surrounded here by several of her students and friends, many of whom read favorite selections from her book during the presentation: (left to right, back row) Shosan Victoria Austin, Ryan Nguyen, Rinso Ed Sattizahn, Simbwala Schultz, Liping Zhu, Junsei Jana Drakka, Judith Keenan; (middle) Jisan Tova Green, Zenju Earthlyn Manuel; (front) Keiryu Li�n Shutt, Barbara Machtinger, Zenkei Blanche Hartman, Daigan Gaither and Zenki Mary Mocine. A live stream recording of the hour is available online, and includes statements from Blanche along with those from the many “readers” of the evening.